Every year Lee Smith and Ross Perkins organise a Boxing Day Charity Football match in East Goscote. This year it was held to raise money for a defibrillator to be installed on Jubilee playing fields, so that it is near the football pitches and play areas. The total raised was a fantastic £850 and has been topped up to £950 by a donation from a previous raffle held in the Chemists. The team are aiming to raise at least another £500 in order to get this project completed. The defibrillator will be for the benefit for the whole village and any extra will be used for future maintenance of the machine. Please consider donating and helping this fantastic project! PCSO Matt Harburt will be holding a beat surgery on February 13th at the East Goscote library between 10am – 11am during the weekly coffee morning. Anyone is welcome to attend and share any issues or just enjoy a coffee. 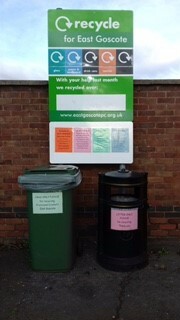 East Goscote Parish Council have taken over the old Charnwood Borough Council Recycling site on Merchants Common. Please continue to recycle your cans, cardboard & paper & clothes with the banks situated there. 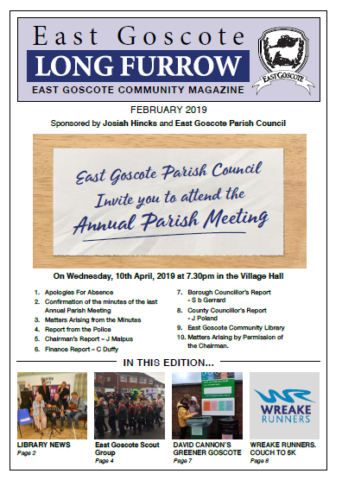 East Goscote Neighbourhood Watch will be hosting a presentation evening, where the Chair of Leicester, Leicestershire & Rutland NHW and representitives from the local policing unit will talk about the benefit of the Watch and how it helps local communities such as East Goscote. The meeting will be held at the Village Hall and will start at 6.30pm. East Goscote’s collection of recycling will move from Friday December 28 to Monday December 31 and the collection of refuse will move from Friday January 4 to Saturday January 5 2019. There will be no garden waste collections from Monday 24th December to Friday 4th January inclusive. Real Christmas trees can either be disposed of at a local tip site, or put out and collected as part of our next garden waste collection (even if you do not have brown bin). Please check My Charnwood to find out when your next garden waste collection will be. A scheme to give away 2,000 free trees to residents in Charnwood has been launched. The borough council has teamed up with the National Forest and contractor idverde to run the free tree scheme and people have until November 16 to apply. All they need to do is email the Council and each resident can request up to two trees. Cllr Eric Vardy, lead member for the environment, said: “We’re delighted to launch the free tree scheme in Charnwood and I would encourage people to apply soon as I am sure the trees will be snapped up. Residents are eligible to choose two trees and there is a choice of three varieties; rowan, wild cherry, crab apple. Trees will be allocated on a first come, first served basis and distributed during National Tree Week which runs from November 27 to December 1.
idverde manages the borough’s parks and open spaces on behalf of the Council. The National Forest is right in heart of the country, embracing 200 square miles of the Midlands. It spans across parts of Derbyshire, Leicestershire and Staffordshire and aims to link the two ancient Forests of Charnwood and Needwood. A 24-year-old man has been charged on Tuesday 16 October following a stabbing in East Goscote. A male of Tinkers Dell, East Goscote, has been charged with one count of section 18 grievous bodily harm with intent to cause grievous bodily harm, one count of common assault and one count of possession of a bladed article. He appeared at Leicester Magistrates’ Court on 17 October and was remanded in custody. The charges relates to an incident in Lilac Way, in which a 35-year-old man suffered a serious stab wound to his neck on Sunday 14 October. He remains in hospital where his condition is now stable. A comprehensive October programme has been put together, which will run from Monday October 15 to Thursday October 25, 2018. 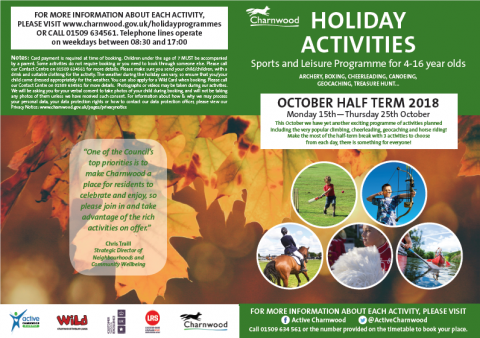 Bookings for October holiday activities will go live from Monday October 1, 2018.